Garden Terrace resident Cathleen Lavoie (middle) was presented with the home’s 2018 Lifetime Achievement Award at a recent ceremony.arden Terrace resident Cathleen Lavoie (middle) was presented with the home’s 2018 Lifetime Achievement Award at a recent ceremony. Garden Terrace resident Cathleen Lavoie has overcome a lot of challenges in the past 10 years. 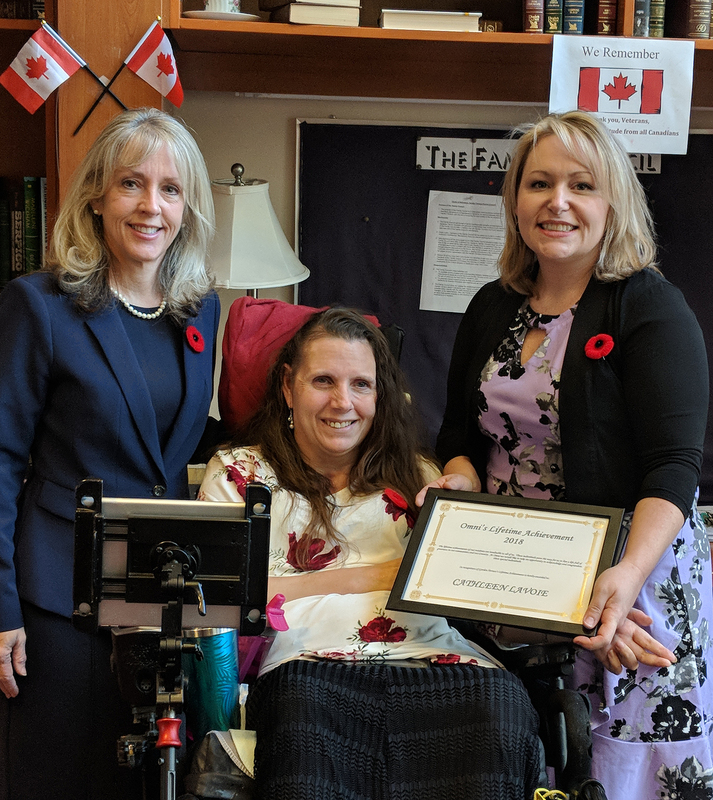 Her perseverance and continued compassion for others following a life-altering incident was recently acknowledged by the Kanata long-term care home. Cathleen was the victim of a horrific act of domestic violence in 2008 that made national headlines when her ex-boyfriend shot her in the neck. The mother of three survived the attack but was paralyzed from the chest down. As a result of her injury, Cathleen required long-term care and moved into Garden Terrace more than seven years ago. But this is not what Cathleen’s story is about. Her story is one of redemption, compassion and not allowing the circumstances of a tragedy to dominate her life, say Garden Terrace team members. “(Cathleen) is someone who has struggled to come back from certain death in an extremely traumatic occurrence. She has not only succeeded in that but has made her time on this earth dedicated to making her family and friends and acquaintances feel appreciated and loved,” says Garden Terrace director of care Chris Ritchie. 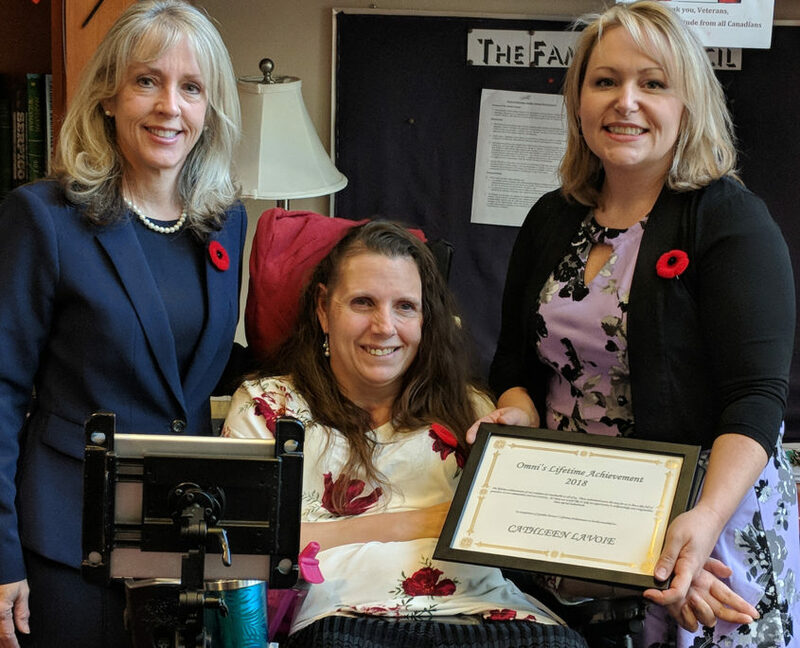 For her triumph in dealing with challenges, Cathleen has been named Garden Terrace’s 2018 Lifetime Achievement Award recipient. The award, which is presented to people living in OMNI Health Care long-term care homes who have demonstrated commitment to others, their home and country, was presented during a Nov. 8 ceremony at the home. Cathleen, Chris says, stays in touch with family and friends, and she has made many friends at Garden Terrace. She is “always dressed beautifully, and her smile is so infectious,” Chris adds. “This amazing woman is strong and wise and sets the bar very high for women who come in her path as she has overcome hardships most of us can only imagine,” Chris says. Administrator Christine Schyf commends Cathleen for her positive outlook on life. Cathleen, who continues to work part time, has chosen not to be bitter about what has happened to her but is instead forgiving. “She has made the choice not to live with bitterness but to treat others how they would want to be treated: with compassion and respect,” she says. If you have feedback on this story, or a story you would like to share with The OMNIway, please contact the newsroom at deron(at)axiomnews.com.